The Serapeion, the place of worship of god Serapis, was built in the 3rd century AD between the Large Warehouse adjacent to the South Agora, and the Faustina Thermae. Zeus Serapis was established as a god by Ptolemaeus I (304-285 BC). His cult was associated with the cult of god Helios from the reign of Septimius Severus (193-211 AD) and his successors, and was widespread throughout the Roman empire until the first Christian years. The Miletus Serapeion was orientated from north to south. Its entrance was on the south, on the same axis with the south side of the Large Warehouse and the north section of the west wing of the South Agora. The temple's location confirms Vitruvius's texts describing the temples of Isis and Serapis as immediately adjacent to the Agora. The architectural plan (measuring 22.5X12.5 metres) of the temple is reminiscent of the type of basilica because its interior was divided into three aisles by two rows of Ionic columns. 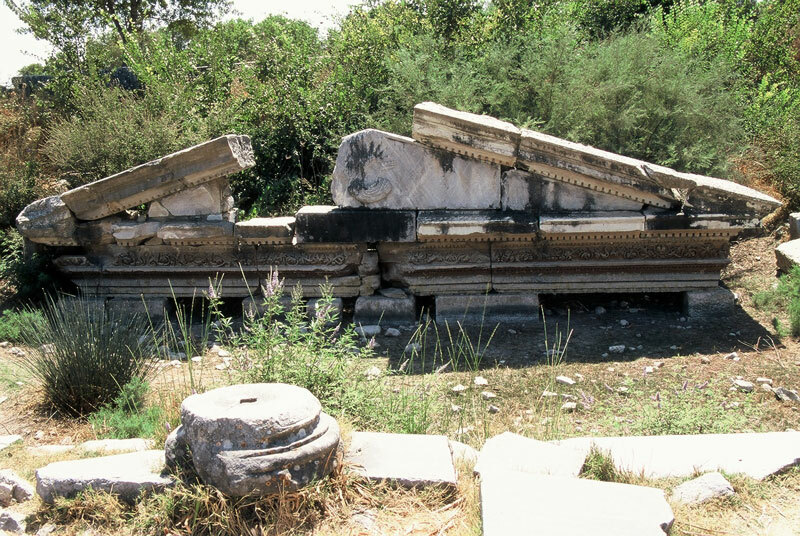 On the north end of the cella, opposite the entrance, there was a platform built on a three-step crepis, which was most probably intended for the display of the cult statue. The entrance to the temple was decorated by a monumental marble propylon offered by the Miletian Julius Aurelius Menekles. 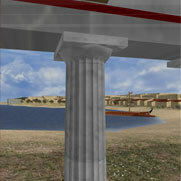 The propylon was raised on a five-step crepis. Four monolithic columns with composite capitals bore an entablature with richly sculpted ornamentation. The figure of Serapis-Helios was depicted on the tympanum of the pediment. The eighteen coffers of the propylon' ceiling were ornamented by reliefs of the figures of Apollo with the Muses -after the model of the archaic cult statue of the god at Didyma-, of Artemis, Hermes, Poseidon and other gods, not all preserved. The iconographic program of the propylon expresses the cult of Serapis as Pantheos, that is a god who represents the power of all gods.